Having a clean comforter is the key to getting a good night’s sleep. 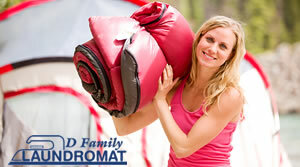 Due to their large size, comforters and sleeping bags often need special care to stay in good condition. Understanding how to manage your bedding will keep it fresh and clean for years. It is recommended to get your comforter cleaned twice a year, once in the spring and then again in the fall. With todayâ€™s Alaska Rewards offer get your comforter, bed spread, or sleeping bags professionally cleaned byÂ D Family Laundromat for only $10, regularly $20. One of the biggest mistakes people make in laundering washable comforters or sleeping bags is in trying to stuff them into a too-small washer and a too-small dryer. Not only doesn’t it come clean, but you can also damage your machine and the comforter. Edges can catch and rip during the spin cycle. Comforters or sleeping bags stuffed into a tiny dryer can scorch (or in the case of synthetics, even melt) as they press up against hot interior surfaces.Â HavingÂ D Family Laundromat take care of your bedding well insure that your comforter or sleeping bag has a long useful life. They will even pickup and deliver your bedding for an added fee. Limit 5 per person. Delivery available for an added fee. Valid for new clients only. Must use each voucher in 1 visit, no cash back. Not valid with other offers.